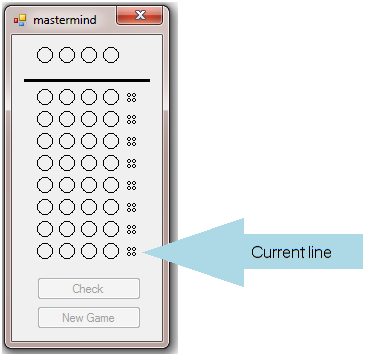 MasterMind is a code-breaking game for two players, in this case, you versus your PC. The commercial board game version of the game was invented in 1970 and is thought to have been derived from a much earlier pencil and paper game called Bulls and Cows (source: Mastermind (board game), Wikipedia), though the name doesn't sound descriptive. In each new game, depending on the level of difficulty, the computer chooses four, five, or six random colors, (Red, Green, Blue, or Yellow) which can be duplicated, so for example, it could be Red, Red, Red, Red. 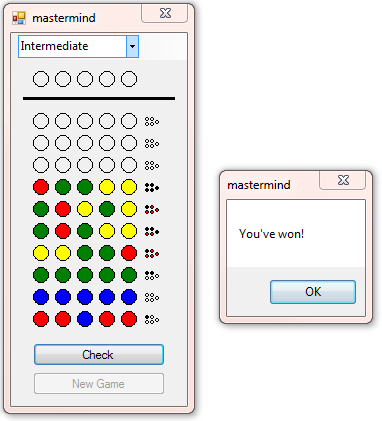 Depending on the level of difficulty, you have eight, ten, or twelve tries to guess the correct sequence of colors, which is done by right clicking the ellipses in the current row (Figure 1), and selecting a color for each of them from the context menus, or you can cycle through the colors by left clicking the ellipses. 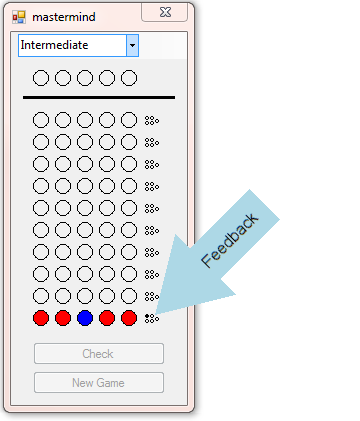 When you have chosen a color for each of the peg positions, the Check button becomes enabled, and you click it to check for wins and to reveal feedback on your guesses (Figure 2). Indicates a correct color, placed in a correct position. Indicates a correct color, placed in an incorrect position. Indicates you have an incorrectly guessed color. Feedback of one Black ellipse (Figure 2) indicates that you have correctly chosen one color, and that the color is in the correct position. 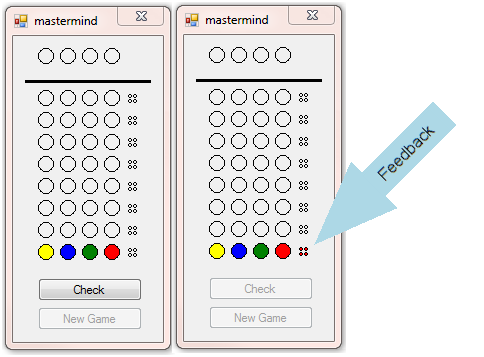 The feedback ellipses don’t directly refer to a position in the line, but to any correct or incorrect color in any position. 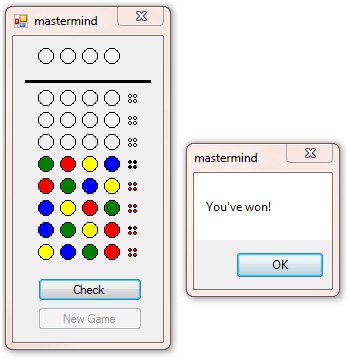 As you progress through the game, the current line moves up one row after you've checked a line, until, either, you correctly guess the sequence of colors (Figure 3), or you reach the top row without winning. The possible color positions count increases steeply as the level of difficulty increases (Figure 4), but these numbers of combinations need to be adjusted because of duplicated colors which drastically reduces the possible permutations. This is the third incarnation of this article, mainly because I wanted to extend the game to make it more interesting, but also because I was concerned about overheads in the previous version (see: Performance Optimization in Visual Basic .NET). I also made some further changes so the program was a better example of OOP (see: Object-Oriented Programming in Visual Basic .NET). 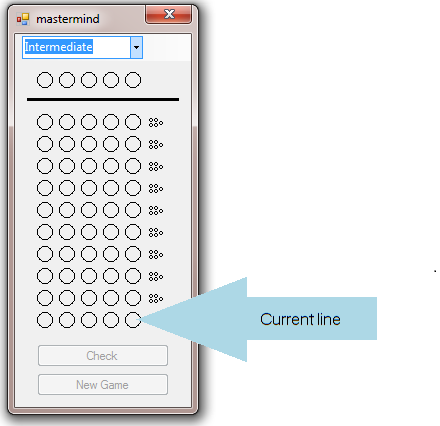 Notice how the ContextMenuStrip only opens for controls in the current line? In the itemClicked event, I raised an event to inform the parent control (Form1) that a color had been set for the pegPlace. On receiving that event notification, the code in the form checks whether to enable btnCheck or not. 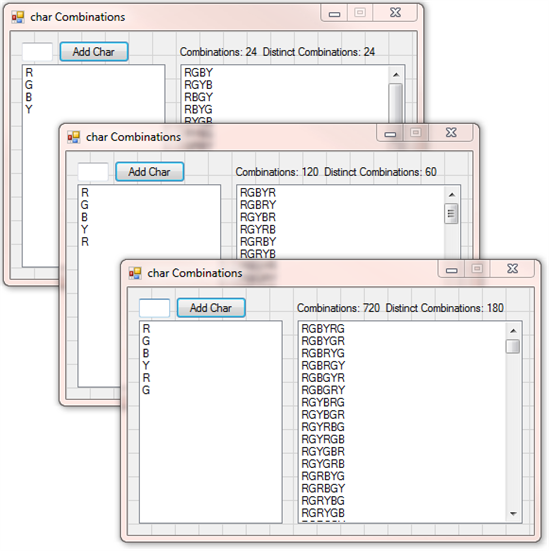 A ContextMenuStrip.Items property contains objects of type: ToolStripMenuItem. ...The btnCheck Click event checks the guessed sequence of colors against the winning sequence of colors. 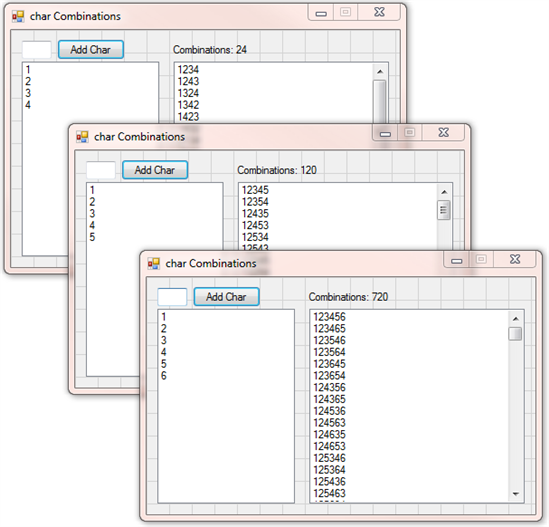 During this checking, the feedback for the row being checked is calculated, then the Paint event is invoked (Control.Invalidate Method) to draw the feedback on the form. You can download the project here. The online version differs from the desktop version, in that it doesn't use a ContextMenu to select colors, but instead just cycles through the colors Red, Green, Blue, Yellow and repeat (and so on), when the user clicks on an ellipse in the current line.